Our Mission at St. Malachy's is to provide an enriching, high quality education, where we learn, love and grow with Christ at the centre, so that each individual feels nurtured and achieve their full potential. Prayer changes things … something that school wants to help all of our children to experience and cherish. Our aim is to link all of our children to a person in the parish through prayer, thus strengthening bonds and supporting the spiritual growth of every one taking part. Strong bonds between Church, School and community are important and we have been involved in a Prayer Partner Scheme since 2016 which has proved so successful. The way it works is this…. Every one of our 196 young people are linked, simply by first name only, to a parishioner. Each of them was given an illustrated prayer card, to display in their home. It has on their name, the first name of their chosen prayer partner, a copy of the special communal prayer, created by the children themselves, and the School’s Mission statement. This special card stays with the child during their time with us, and hopefully through life. All of our young people are encouraged to pray the prayer in their daily time of reflection, class or whole-school collective worship, and at times of celebration throughout the year. Every adult in the scheme received his or her own dedicated prayer card. The card has only the first name of their and prayer partner in school, to make the scheme safe for all. Our young people’s special prayer is also on the card, to pray daily or as often as possible. Knowing that someone else, you have not met is regularly praying for you, and you are praying for him or her, can be of great comfort. It brings encouragement to the young and strength and fortitude for those of us who are older. Prayer Partners bring us closer together through the power of prayer, as prayer brings us closer to God. 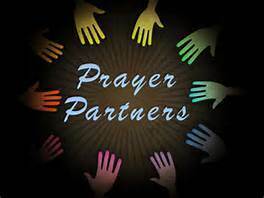 If you would like to be part of next years Prayer Partner Scheme, please contact school. As we pray for our special prayer partner, we ask you to be close to them, to guide them, to keep them safe, to strengthen them and to bless them with the happiness of your love. Help them to be strong if they are weak and brave if they are scared; knowing that their prayer partner is thinking of them.